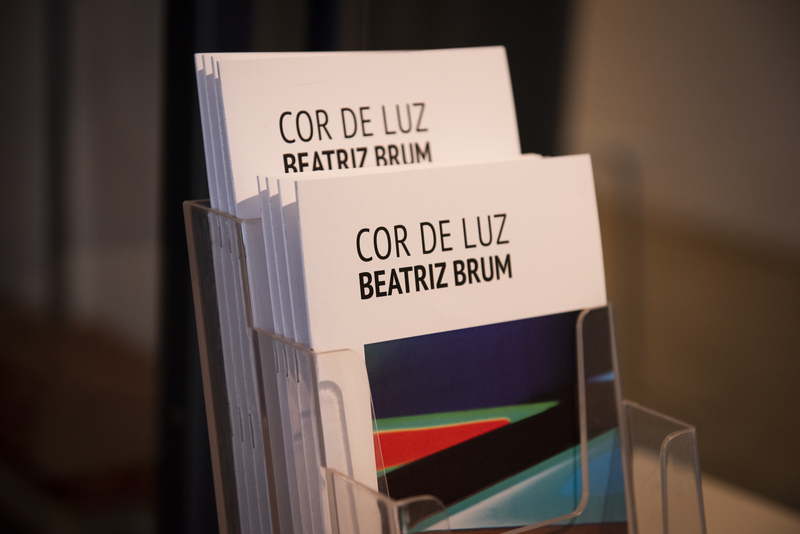 Very opportune book [and project], for these days there might be more curators than artists. Reminds me of the ANAMNESE initiative some years ago. This is a precious sum-up, cleverly taking advantage of the egos of the intervenients in order to unravel a multivocal narrative on the motivations behind curatorship. 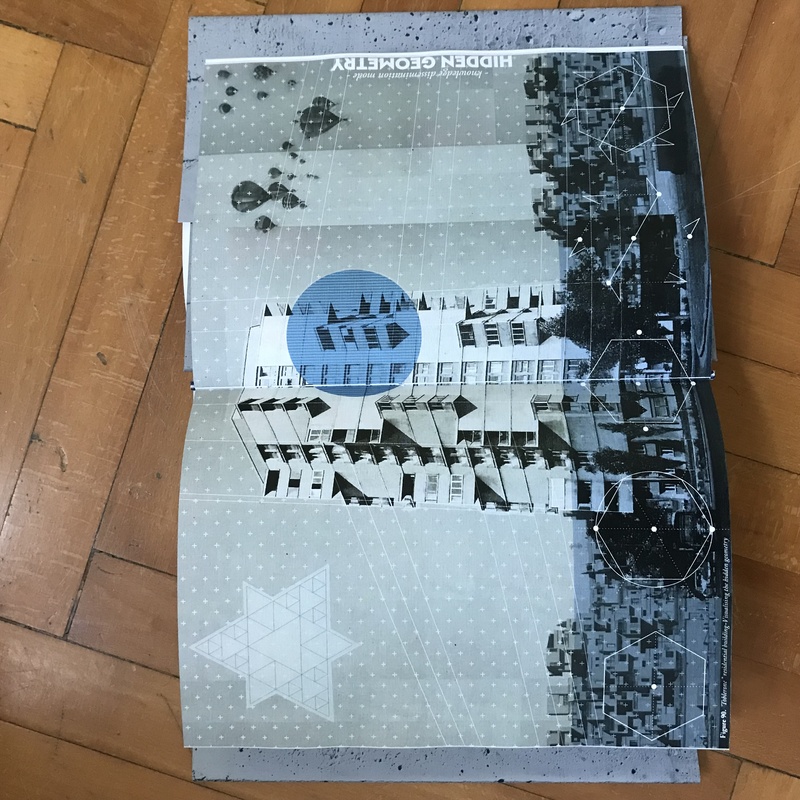 The ‘MacGuffin’ effect – asking us to present an artwork by ourselves… – led to something more democratic and substancial: the publication of a hundred interviews, both short and enlightening. 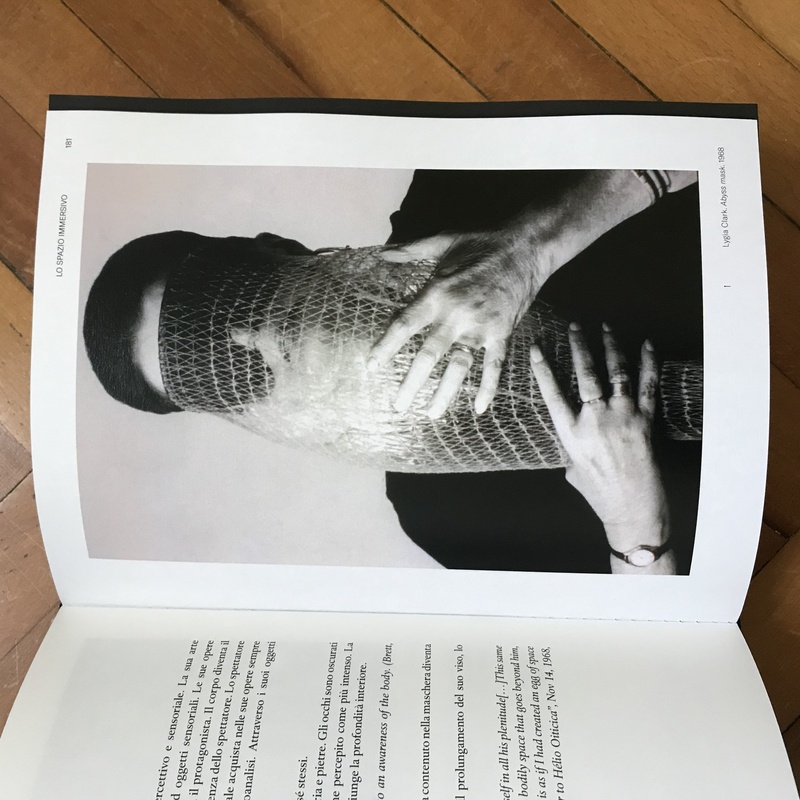 And there’s of course the appropriation of the image of the iconic book by Obrist – through the graphic design. 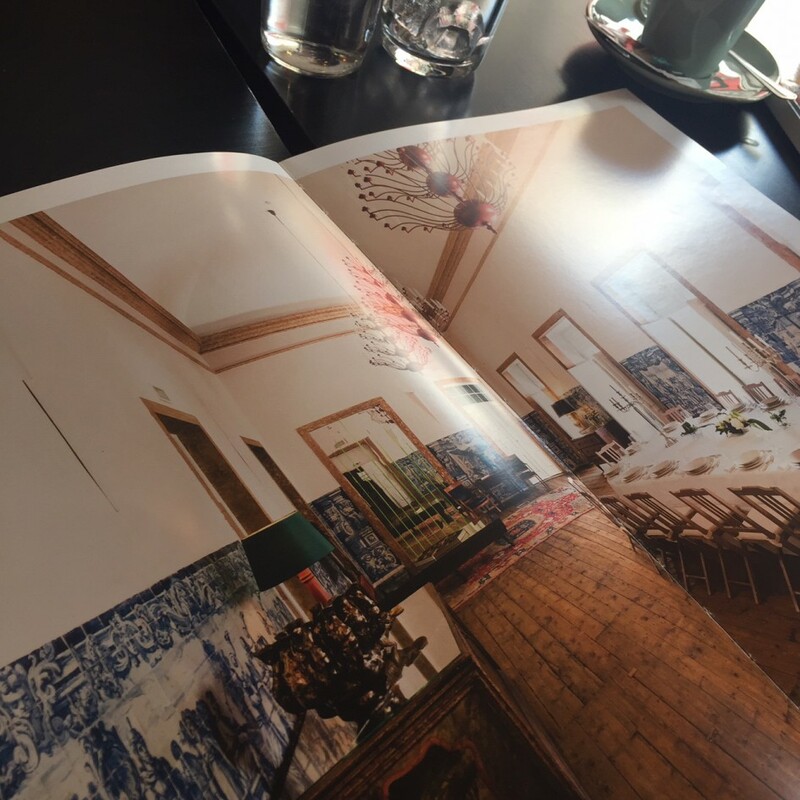 Furthermore, the edition pays a tribute to three heroes in the field: Ernesto (de Sousa), (Paulo) Reis & (Paulo) Cunha e Silva. Ah! And there’s a brilliant text by Carlos Vidal. 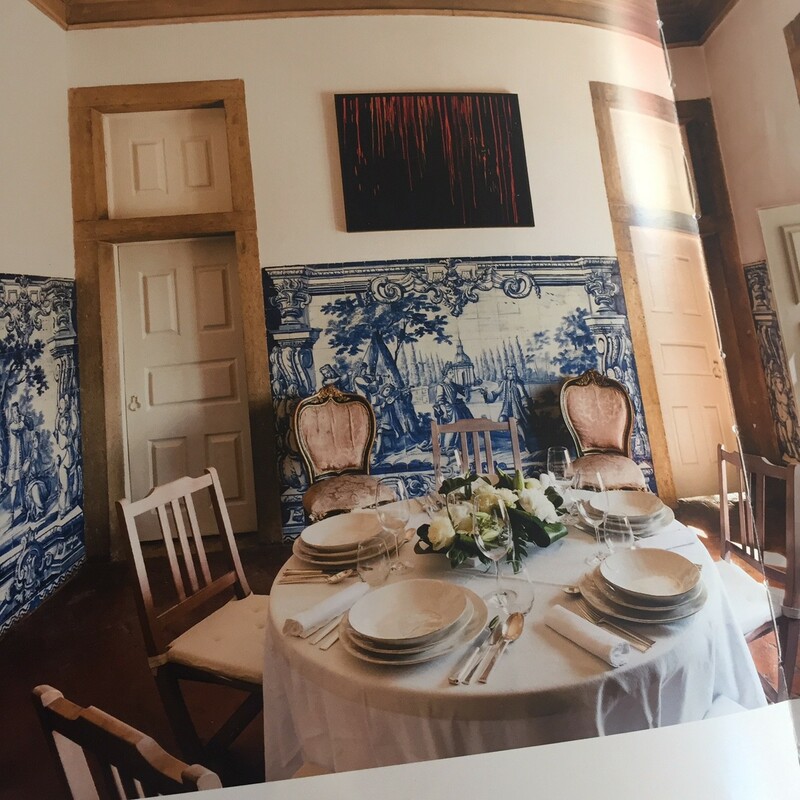 Livro [e projecto] muito oportuno, por estes dias em que artistas há poucos e curadores há muitos. Como a iniciativa ANAMNESE há uns anos, eis uma deliciosa peça de consulta, que joga muito bem com os egos dos intervenientes para desvelar uma narrativa múltivoca sobre as motivações da curadoria. Brilhante como o efeito ‘MacGuffin’ – o pedir-nos uma obra de arte da nossa autoria para ser mostrada – levou a algo de mais democrático e substancial: a publicação de cem tão curtas quanto iluminadoras entrevistas, num livro que é uma irónica apropriação da imagem do icónico livro do Obrist – desde logo ao nível do design gráfico. Trata-se finalmente, também, de uma delicadíssima homenagem a três heróis do comissariado: Ernesto (de Sousa), (Paulo) Reis & (Paulo) Cunha e Silva. Ah! E há um brilhante texto do Carlos Vidal. 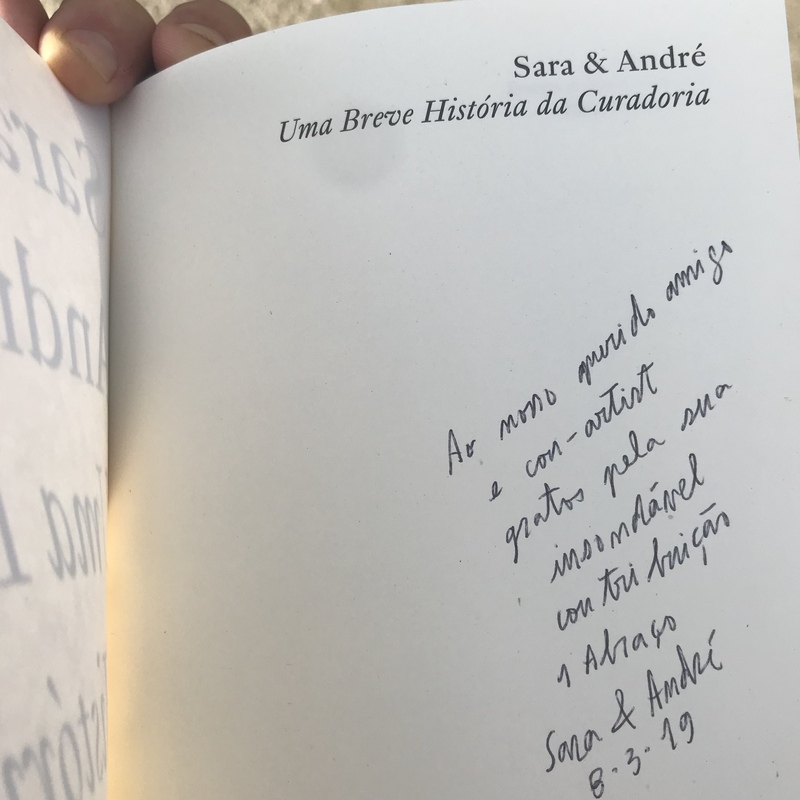 PS Quando pedi à Sara e ao André uma dedicatória, fui confrontado com o mesmo desafio que estes indómitos oportunistas lançaram aos/às colegas: ‘Dita-a, que a gente a escreve’. 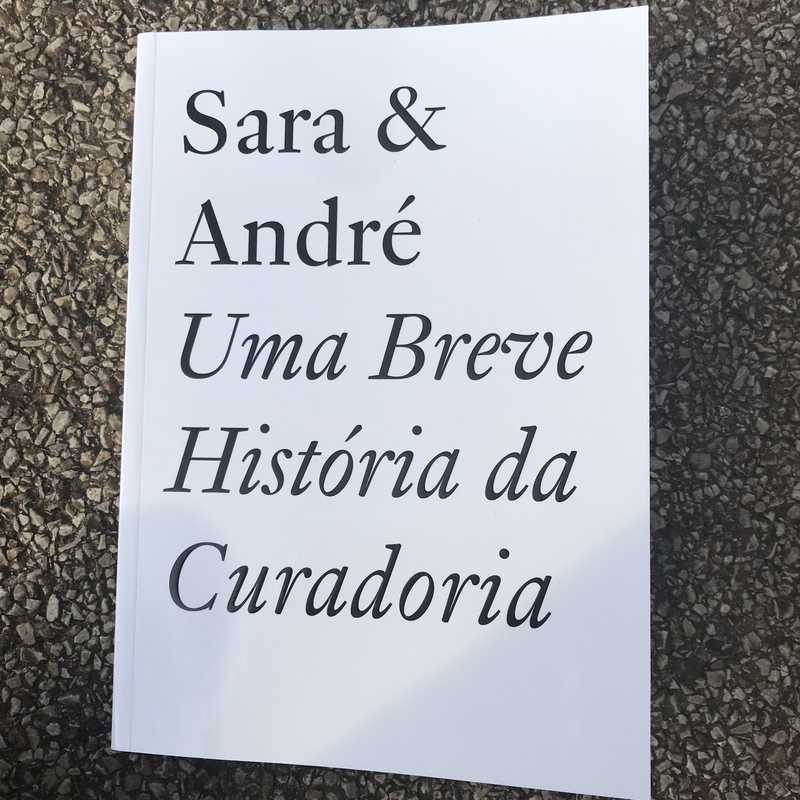 E assim ficou: Ao nosso querido amigo e con-artist / gratos pela sua insondável contribuição / 1 Abraço / Sara & André / 8.3.19’ A arte relacional no seu mais íntimo esplendor. Para a entrevista completa, espreitar aqui. 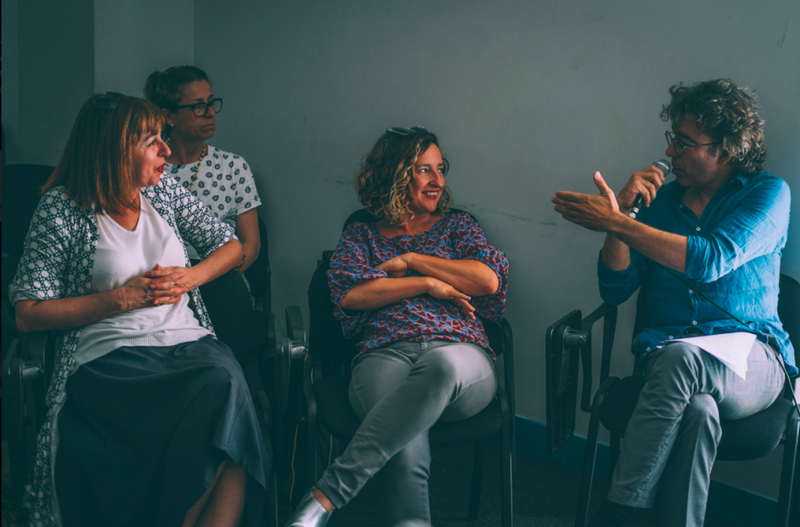 Milano Design PhD Festival 2019 is all about enthousiastic researchers meeting to share their diverse visions and particular interests. I ended up in the Smart Spaces and Cities panel, having the privilege of discussing the theses of Maria Elena Soriero, Bogdan Stojanovic and Isa Helena Tibúrcio. 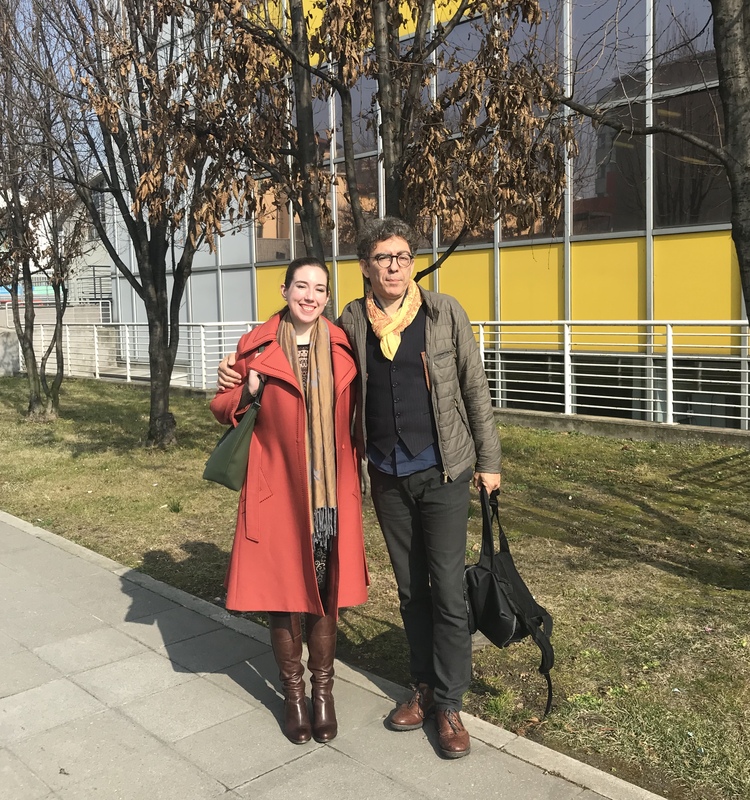 At my side, in her first participation in an international commission, Serbian researcher in Art History Vladana Putnic Prica, who enjoyed as much as myself the many differences in the evaluation procedures, in comparison to what happens in our countries’ universities. With Vladana Putnic Prica, from (New) Belgrade. Looking closer into the works presented. The first, Maria Elena Soriero, was no less than a taxonomical tour de force; through a rigorous methodology of classification, she unveiled an evolutional narrative within Contemporary Art – from Immersion to the Cyborg – based on the analysis of major art-works (and as well a few other cultural expressions in Visual Culture) which are establishing a Technonatural paradigm of experience. 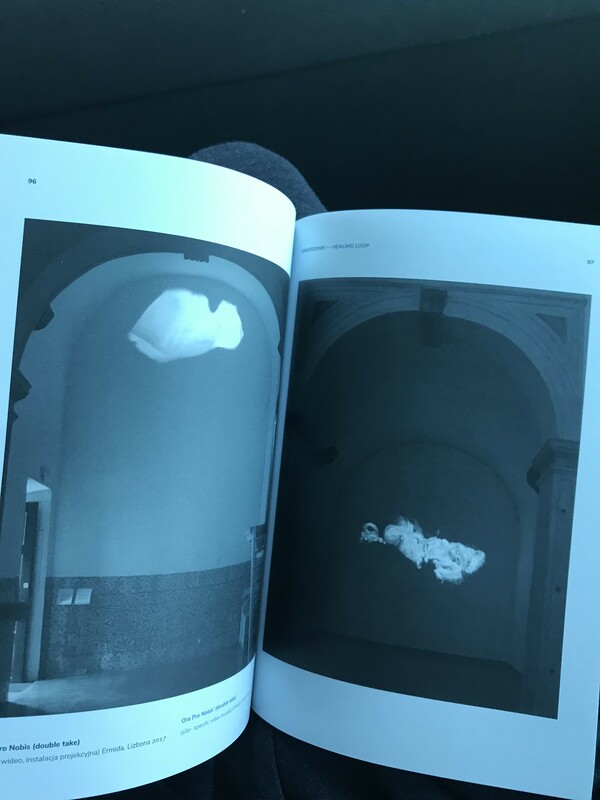 Always a pleasure to revisit the aesthetic of the likes of Bill Viola, Olafur Eliasson, Lygia Clark (photo below) or… Björk, now through such a specific, but nevertheless crucial lens. Bogdan Stojanovic’s work is encapsulated in a 5 lines long title: ‘Enhancement of Contemporary Architecture through a Meaningful On-site Experience. Novel design strategies for raising awareness of the eastern modernist architecture towards the major audience’. Uf. The fact is that the research is far from boring; it’s a brilliant take on the Smart Cities’ trend, managing to be both caring for locality (the Modernist built heritage of New Belgrade) and offering new generations and publics a multilayered and engaging audience development strategy (communicated by means of clever infographics). We’ll soon hear more from this guy, in an (Intelligent) city near you. Mark my words. 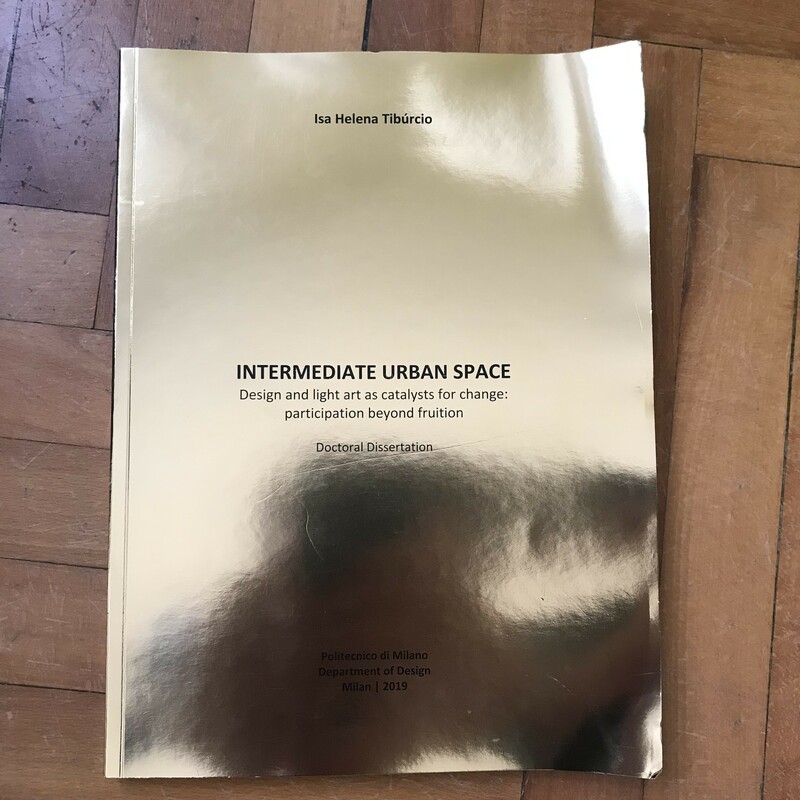 Finally, the morning marathon would come to an end with Isa Helena Tibúrcio’s proposal of Light Art as a tool to generate and affirm Intermediate Urban Space. Luxo vs. Lixo or on how to operate from the perspective of a heart of gold. 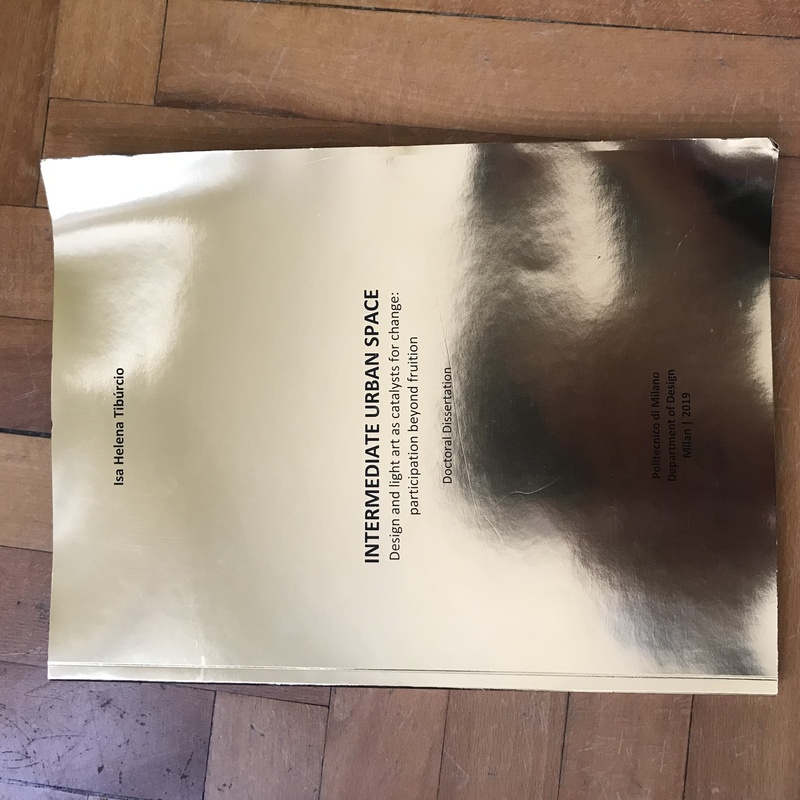 This is a very timely appropriation of Light Culture – which she approached through interviews with extraordinary artists such as Carlo Bernardini or Marco Brianza (Lux Matrix Tallinn) – for the sake of the involvement of ordinary people in conscious change. Brazil, are you listening? Below, Bogdan (Stojanovic, PhD. 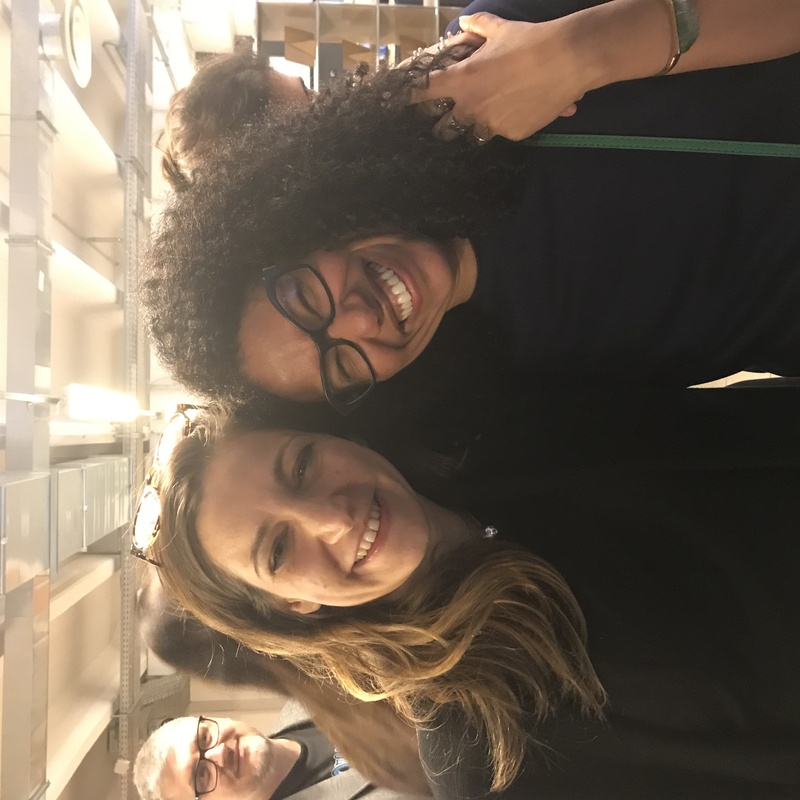 ), and Maria Elena (Soriero, PhD) with Isa (Helena Tibúrcio, PhD). 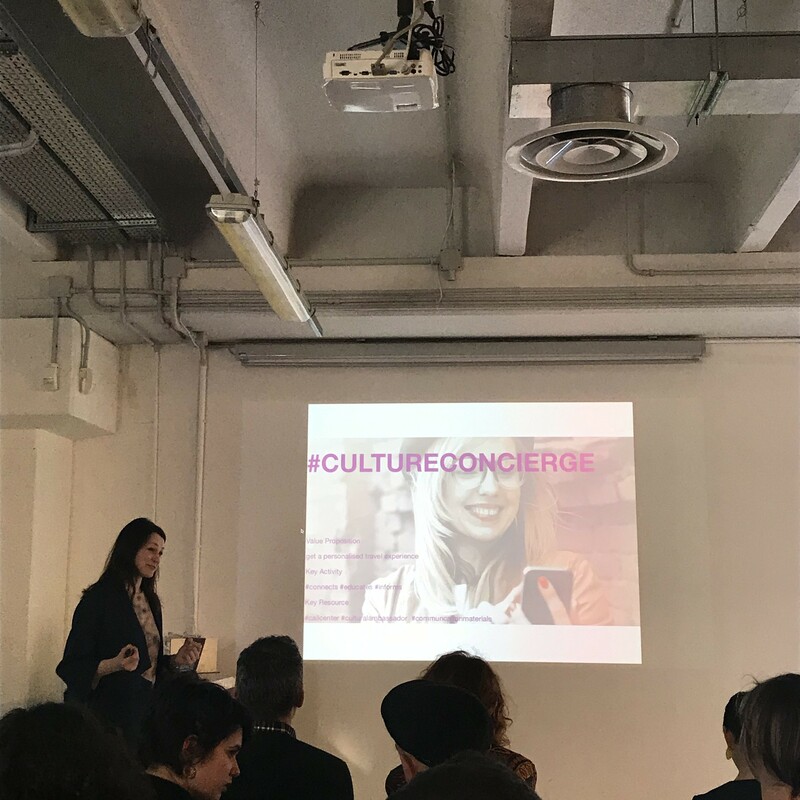 The afternoon at the Polifactory – POLIMI’s creative hub – was no less intense, with all the members of the several evaluation comitees giving highly personal lectures in an atmosphere of sheer informality, generosity and… provocation. 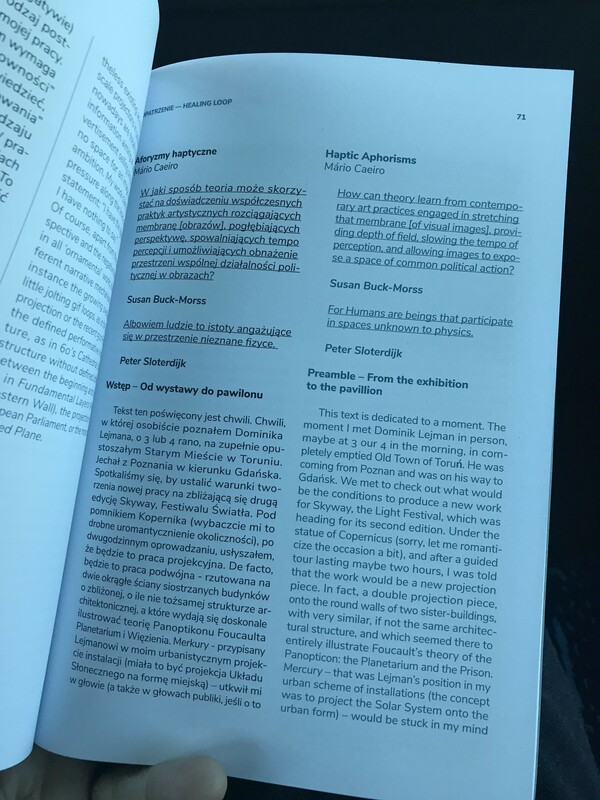 A couple of these talks made my day: specially the proposal of a Happy Kaunas 2020 Contemporary Capital of Culture, by Jurate Tutlyte, and the passion with which Christian Gilles Boucharenc shared with a perplexed and delighted audience what Finnish and Japanese (!?!) design traditions might have in common. Des mots et des images justes! 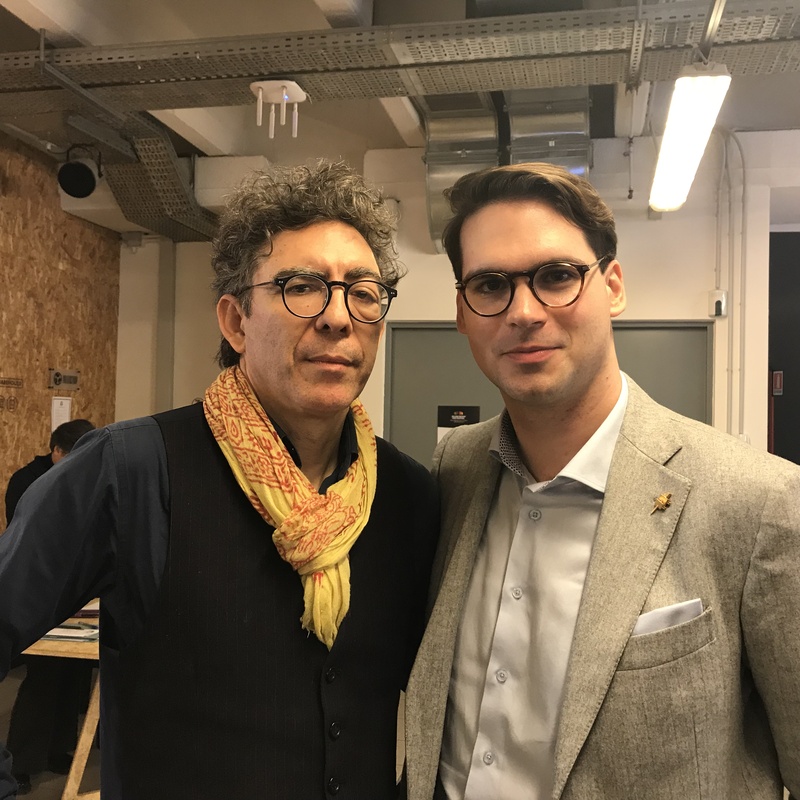 Two talks with Universal appeal, in fact establishing a fine dialogue with the opening Lectio Magistrali: Pietro Marani on Leonardo da Vinci as Designer and Arturo DellAcqua Bellavitis explaining the historical reasons why Milano became a vibrant world capital of design. Judging by the quite amused international smiles In the group, also my talk on Dominik Lejman’s Haptic Aphorisms went also quite well. My special thanks to ESAD.CR and of course POLIMI for this wonderfully intense couple of days. Designing ideas. 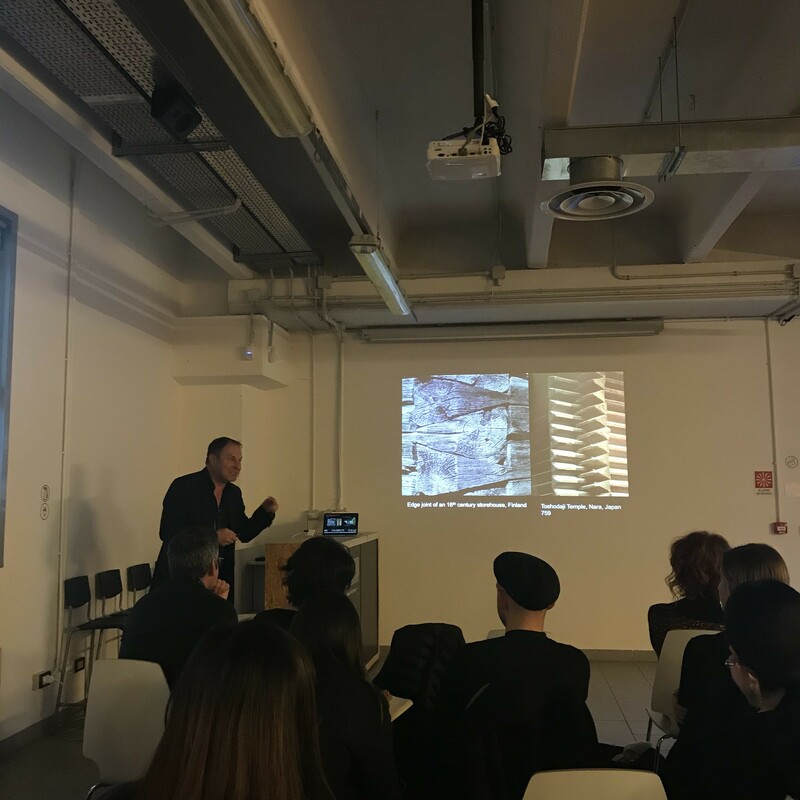 Christian Gilles Boucharenc sharing his passion for the details which unravel hidden links between Finland and Japan, Architecture and Design. And Jurate Tutlyte unveiling the guiding lines of Kaunas (Contemporary Capital of Culture 2020. Very happy to be participating as an author in Dominik Lejman‘s new book, Healing Loop. In good company: Mark Gisbourne, Hubertus v. Amelunxen and Dominik himself interviewed by Ulrich Loock. These were probably the most difficult and challenging pages I ever wrote, for I had to be true to the vision and work of an extraordinary artist. 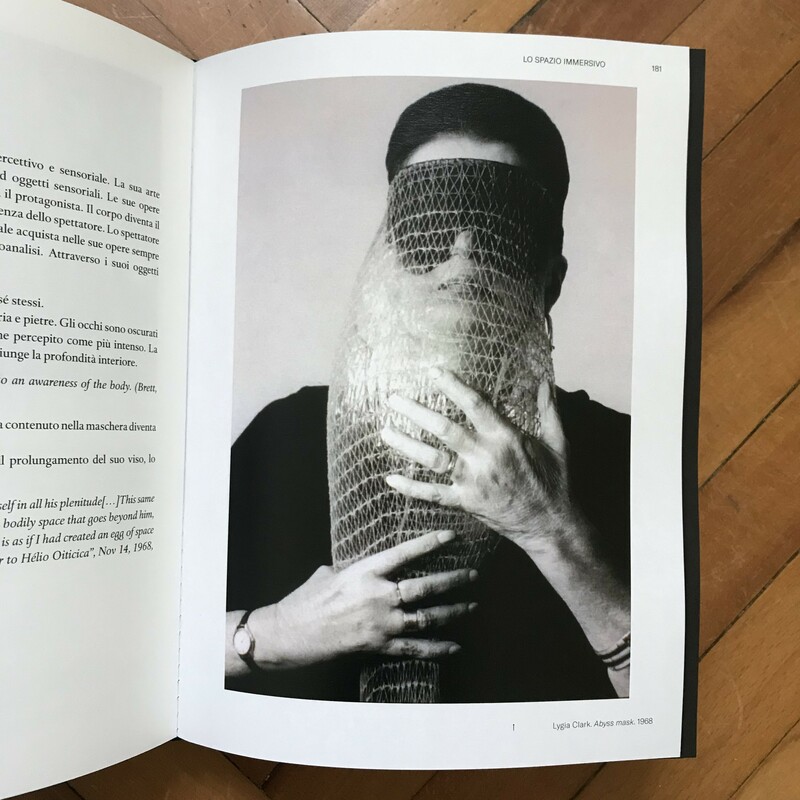 As a matter of fact, the text has been a timely opportunity to reflect on a few personal insights arising from the collaboration between curator and artist. The book was published on the occasion of “Healing Loop”, the first retrospective exhibition of Dominik Lejman in Gdansk. 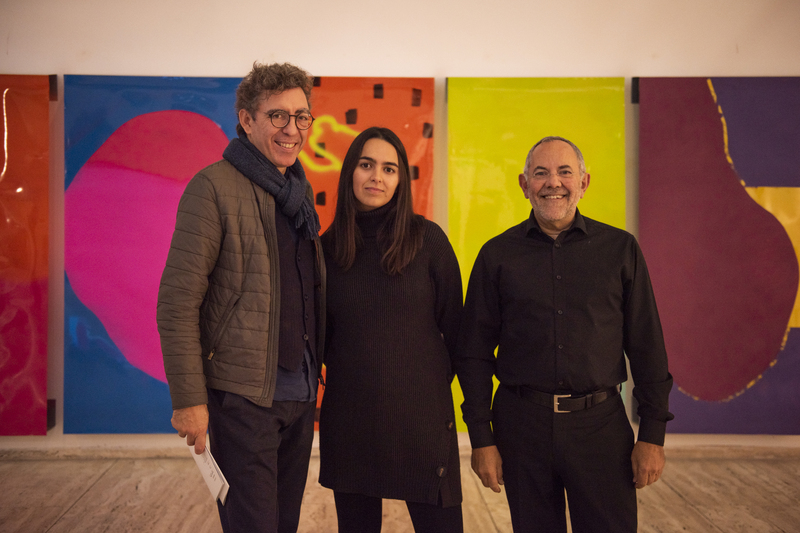 The show presented some of the most important works of the artist from the last decade and a new video fresco – “Inclined Plane” – specially prepared for the exhibition in the LAZNIA Centre for Contemporary Art. 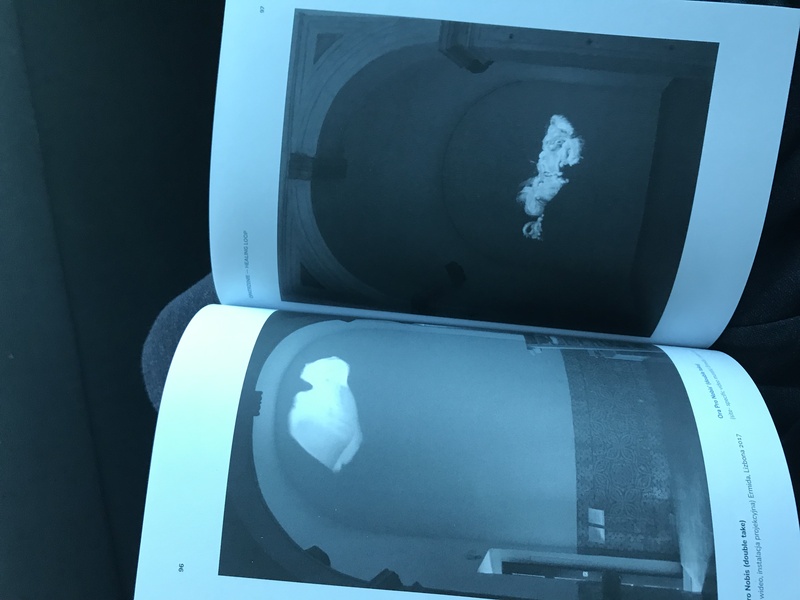 In a very impressive way, the presented works were combined not only in terms of content, but also in terms of formal surgery– a way of operating which is characteristic of Lejman’s concept of “switching on of the lights in the cinema”. In a somehow tautological move, the specific logic of works at the exhibition can be furthermore defined as of a “healing loop” because repetition restrains the magnetism of the image in order to underline the presence of the viewer in the exhibition space. Very special thanks: Jadwiga Charzynska and Dominik Lejman. And to Nuno Carvalho, for the help in the revision. PS. : It’s a book you may definitely judge by the cover. Muito feliz por participar como autor no novo livro de Dominik Lejman, Healing Loop. Em boa companhia: Mark Gisbourne, Hubertus v. Amelunxen e o próprio Dominik Lejman entrevistado por Ulrich Loock. Estas foram provavelmente das páginas mais difíceis e desafiadoras que alguma vez escrevi, pois havia que ser fiel à visão e labor de um artista extraordinário. 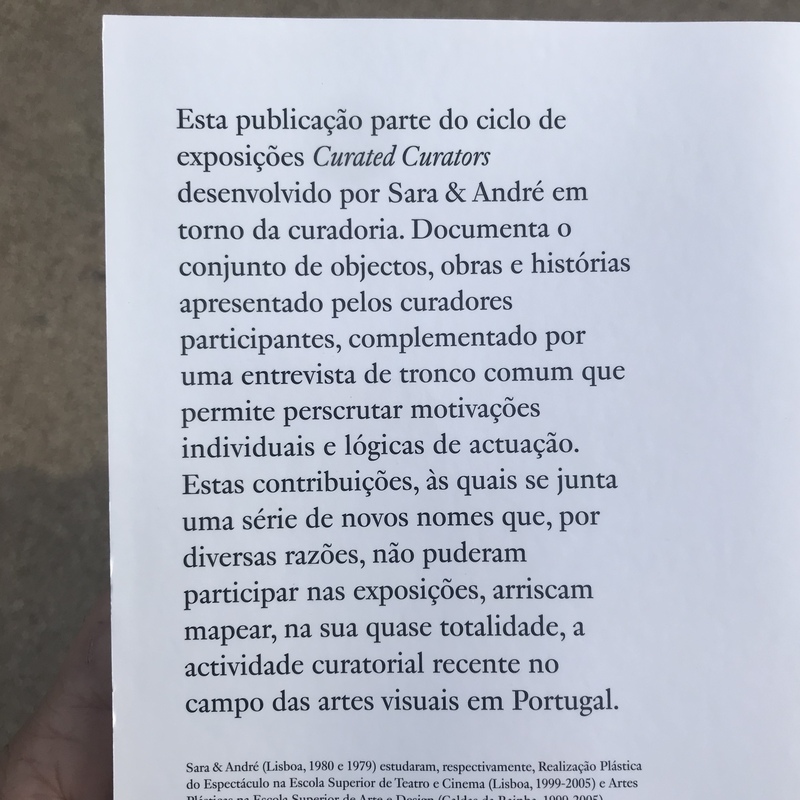 A verdade é que o texto foi uma oportunidade para reflectir sobre algumas ideias pessoais que nasceram da colaboração entre curador e artista. O livro foi publicado no âmbito da exposição “Healing Loop”, a primeira retrospectiva de Dominik Lejman em Gdansk. A exposição apresentou algumas das mais importantes obras deste artista realizadas na última década e um novo fresco vídeo– “Inclined Plane” – especialmente concebido para a exposição no Centro de Arte Contemporânea LAZNIA. Num registo impressivo, as obras apresentadas formam um conjunto não tanto dos seus conteúdos, mas em termos de cirurgia formal – um modo de operar característico da actividade que Lejman define como a de “ligar as luzes no cinema”. Num movimento de algum modo tautológico, a lógica específica destes trabalhos expostos pode ser definida como de “healing loop” (loop curativo) na medida em que a repetição contém o magnetismo das imagens para nelas sublinhar a presença do espectador no espaço expositivo. Obrigados muito especiais: Jadwiga Charzynska e Dominik Lejman. E a Nuno Carvalho, pelo apoio à revisão. PS. 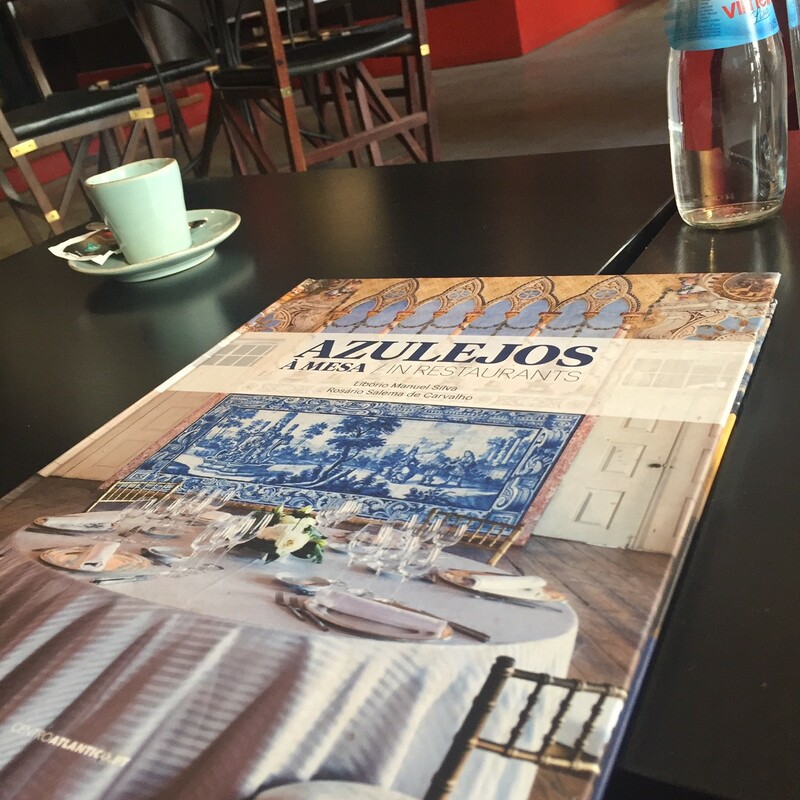 : Trata-se de um livro que podemos sem dúvida julgar pela capa. Look at us! Words aren’t needed. Somewhere in Lisbon, a few years ago. This man is a living myth. His name is Mendes, Albuquerque Mendes. His art is restless and free. Nossa! Ó para nós. Palavras para quê? 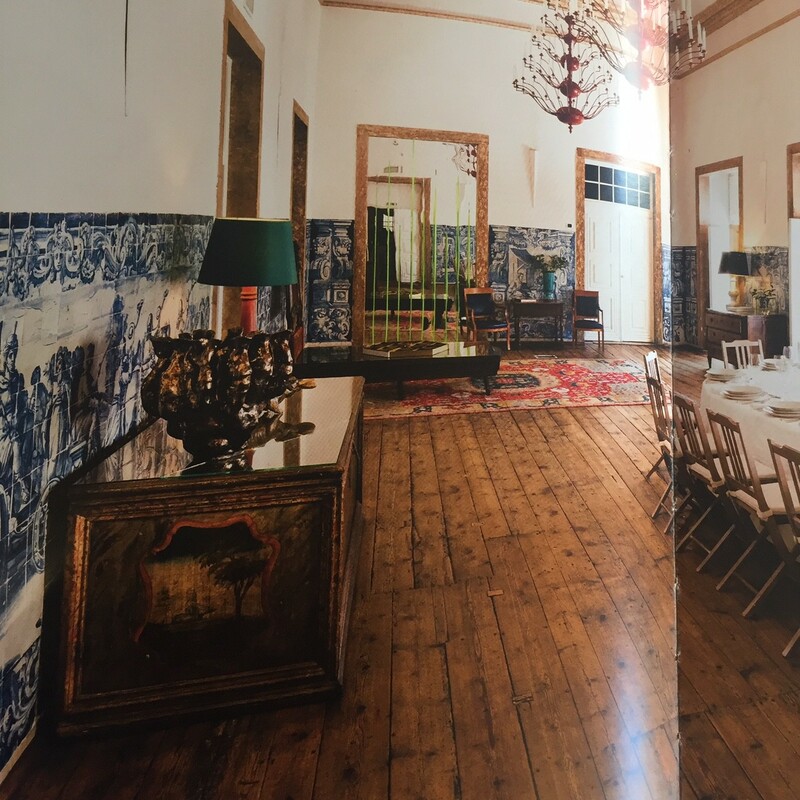 Algures em Lisboa, num destes anos. Este homem é um mito vivo. De seu nome Mendes, Albuquerque Mendes. A sua arte é inquieta e livre. Nossa! Out of the blue. And into the black. 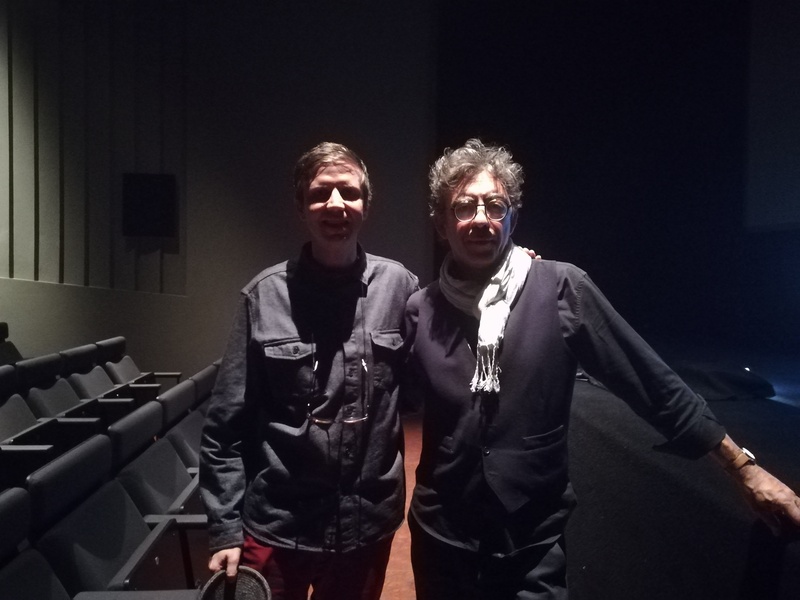 I dropped by at the doclisboa film festival to check it out and… bingo! Got to watch The Unicorn, by Isabelle Dupuis and Tim Geraghty. The film is extremely important. It raises the right issues in times of generalised insanity, in a world turned upside down by conformism. The work tells the story of an outsider musician and his luminous calvary as a citizen and the victim of a social system which appears to deal badly with certain differences. What is crucial in this small masterpiece is that it shatters any given ideas with the pure immanence a personality that the spectator tries to understand through the shreds of memories and of family and social relations. Peter Grudzien is a sort of marginal genius. An icon of alt-country. He visibly orchestrates his presence in the movie, a microcosm of human emotions which is redeemed by the images and the precious empathy they generate. This the story of a life, of several intertwined lives, and never indulges in the obvious, the easy, the immediate or the moralist. It’s rather a sharp tribute to the inexorable complexity of the Human. In a project like this (it took 5 years), what is crucial is to let the final cut articulate, in a seductive way, a narrative which is to remain both closed and open. Many topics are dealt with – America’s drift toward crisis, Mental Health… too name a couple – and above all interlinked fluidly, redeeming a bio-graphy. The one of an artist who had to deal with terrible ghosts and, in the end, prevails ‘in his own way’. 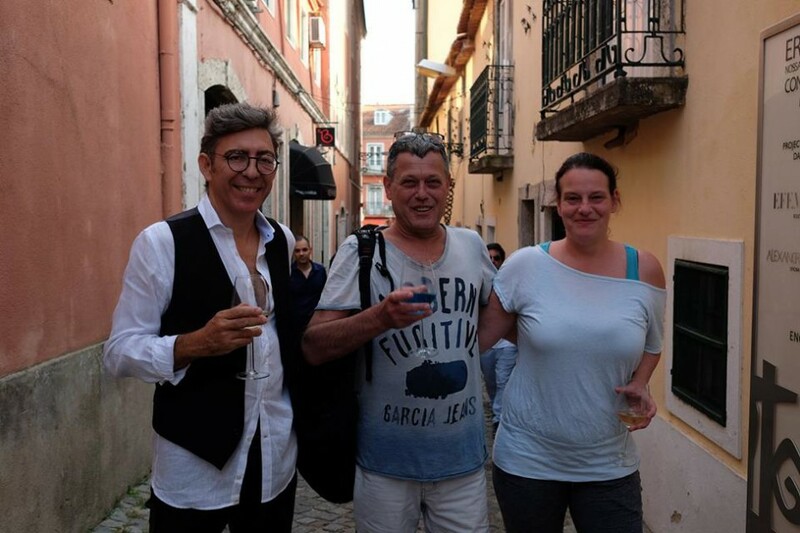 So there he is (pic above) – Tim Geraghty – the man who edited the images gathered by Isabelle with such dexterity and musicality that in the end I asked my companion: – The movie lasted what… 45′? – No, Dad! Two hours…! Looking back, maybe this experience will only be complete when I get to listen the vinyl. America from the Twilight Zone? There’s a Star Spangled Banner Waving Somewhere. Out of the blue. And into the black. Uma ida ‘random’ ao cinema, para apanhar algo do doclisboa, deu nisto! 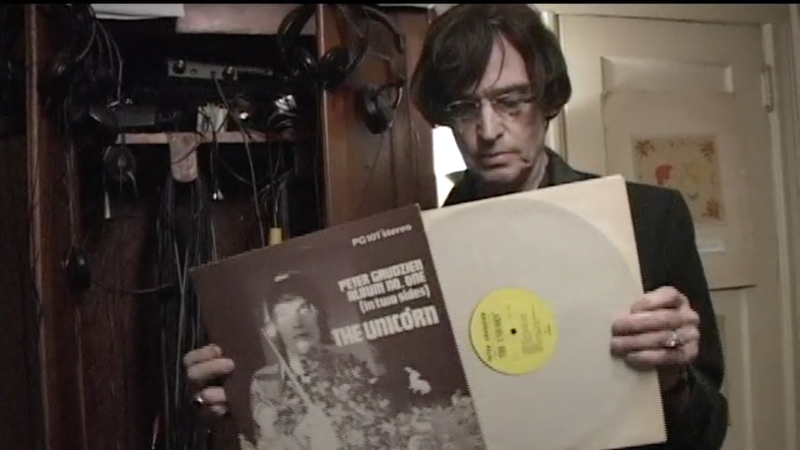 Fui parar ao documentário The Unicorn, de Isabelle Dupuis e Tim Geraghty (na foto). O filme é de enorme importância. Precisamente face ao quadro de insanidade generalizada de um mundo virado às avessas pelo conformismo. A obra trata de um músico outsider e de seu luminoso calvário enquanto cidadão e vítima do sistema social incapaz de lidar com certas diferenças. O que é fundamental na obra é que estilhaça quaisquer ideias feitas com a pura imanência de uma personalidade que vamos reconstruindo à medida que vamos juntando farrapos de memórias e de relações familiares e sociais. A personagem principal é Peter Grudzien, espécie de génio marginal do que virá a ser o alt-country [agora arranja-se etiquetas para tudo, não vá o mercado tecê-las). Ela como que orquestra a sua própria presença num microcosmo de emoções humanas não tanto escalpelizado quando verdadeiramente redimido pelas imagens. Pela preciosa empatia gerada. Esta história de uma vida, ou melhor de várias vidas inevitavelmente cruzadas, em momento algum resvala para o fácil ou o imediato, para o óbvio ou o moralista; constitui antes um elogio, no fio da navalha, de uma inexorável complexidade do humano. Parte essencial de um projecto deste calibre (meia década de rodagem) é a capacidade de a montagem articular, de forma enleante, uma narrativa simultaneamente fechada e aberta. Os pontos tocados – e enumero apenas um par deles: de uma América à deriva ao tema sempre delicado da Saúde Mental –, e sobretudo a forma com se vão encadeando com naturalidade, resgatam uma bio-grafia. A de um artista que teve de lidar com terríveis demónios e, ao final, à sua maneira, até sai ‘por cima’. Foi este senhor, Tim Geraghty, que tratou da fundamental tarefa de editar o acervo e imagens recolhidas por Isabelle. Fê-lo com uma destreza e uma musicalidade que levaram a perguntar no fim, à minha companheira de sessão: Isto foram o quê, 45’? — Não pai! Foram duas horas…! A experiência se calhar só ficará completa um dia destes, quando ouvir com calma o vinil. America from the Twilight Zone? There’s a Star Spangled Banner Waving Somewhere. P! Festival, conversation with Jorge Louraço Figueira (host), Pablo Alvez and Joana Craveiro. I have the pleasure to share the recording. 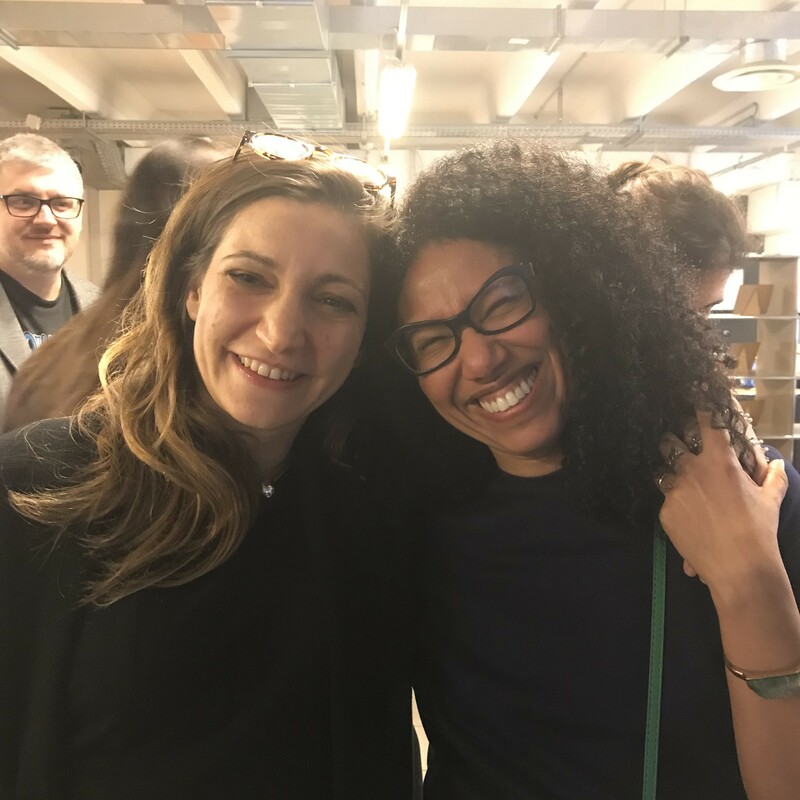 Thank you Levina and Ana Pais, for such a fluid moment of sharing. Christine Greiner was in the audience, and that made my day. The P! e-book is a must-have. No Festival P!, à conversa com Jorge Louraço Figueira (moderador), Pablo Alvez e Joana Craveiro. A gravação foi feita, há que partilhá-la! Obrigado Levina e Ana Pais, foi momento muito bem passado, na fluidez da partilha. Com a Christine Greiner entre o público, ganhei o dia. O e-book é incontornável. 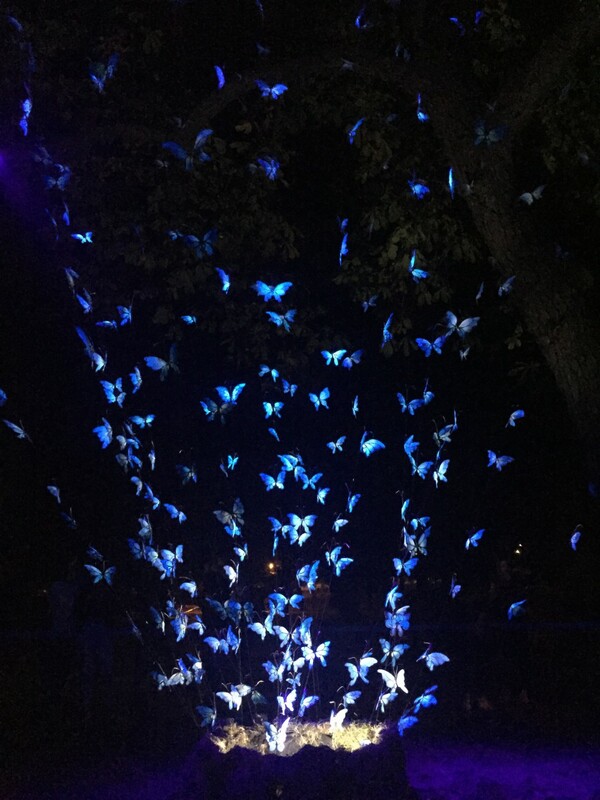 Butterflies burst from the earth in the park at Rapackiego square in Torun. Still Alive is a terrifically poetic installation by Anna Galas. It is part of Bella Skyway 2018. 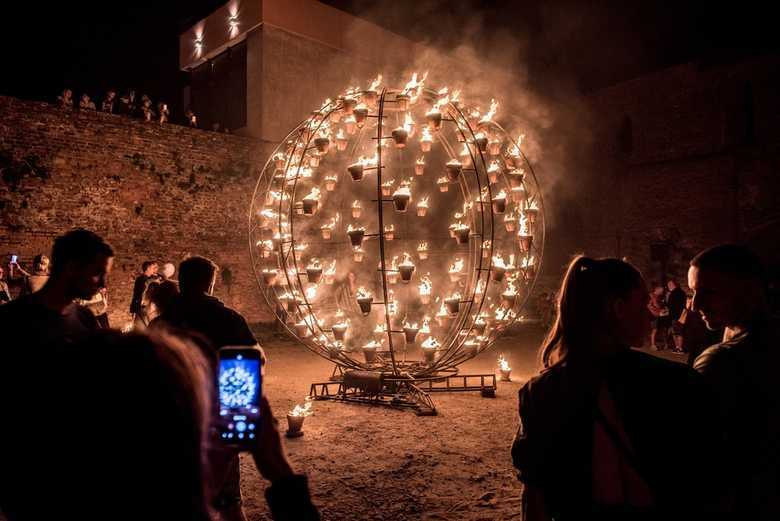 Arriving at the tenth edition, the Festival is a landmark event in the region of Kujawsko-Pomorskie. The impossibly photogenic Polish town of Torun received for a whole decade hundreds of artists and artworks, among which I could highlight so many. I remember with special fondness the urban interventions at Ciasna by MOOV+Miguel Faro and André Banha, Jana Matejkova’s Wish Comet, Raoul Kurvitz’s Cathedral, ATSARA at Bulwar Hotel, Rochus Aust rocking’ the Fosa, the Nuno Maya & Carole Purnelle’s large scale projections, as well as the ones by Limelight, the coloured environments of the Architects of Air by the river… I could go on and on… not to mention, more recently, the delicate shadows of Alessandro Lupi and Anita Ackermann. So many memories! This year, visiting the festival I am proud to have created in 2009, a couple pieces really stand out. 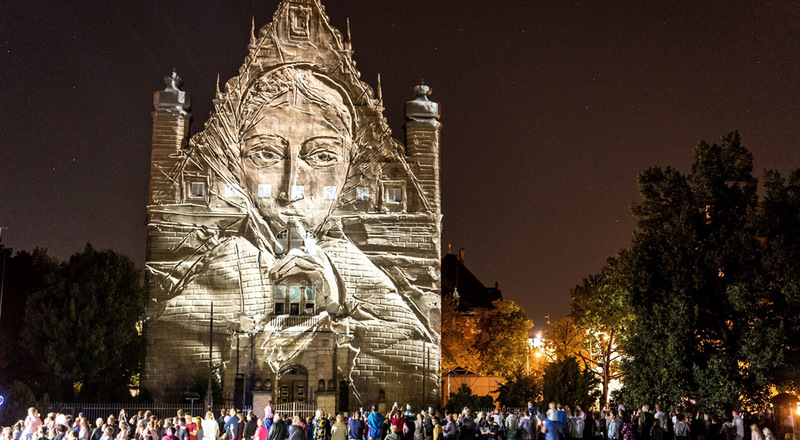 The peculiar stop-motion animation video-mapping projection at Collegium Maximum by Anna Pytlak and Łukasz Kosela (with the participation of the Torun Symphonic Orchestra) and of course the warm fire sculptures by veterans Carabosse, finally in Torun! 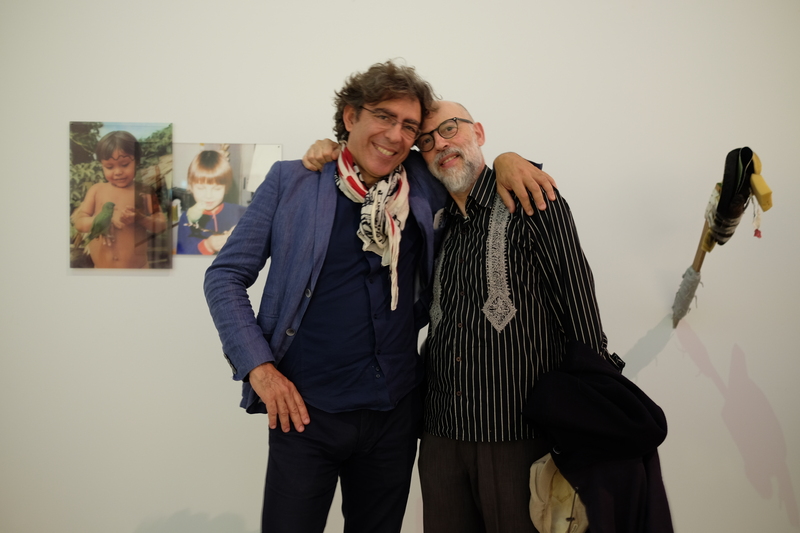 And hey, it was good to see you, Marcello! AreaOdeon‘s Laser Symphony will remain a highlight of this Festival’s whole first decade. In a dreamlike atmosphere, laser technology at the service of pure direct collective musical interaction, illuminating the geometries of the space – Torun’s iconic Town Hall – and the details of the surrounding architecture. The spirit of the original Skyway is here. The video below is of a previous installation of the same concept, in the city of Riga. The light community never stops believing in magic, wonder and development. Borboletas irrompem do solo no parque junto à Praça Rapackiego em Torun. 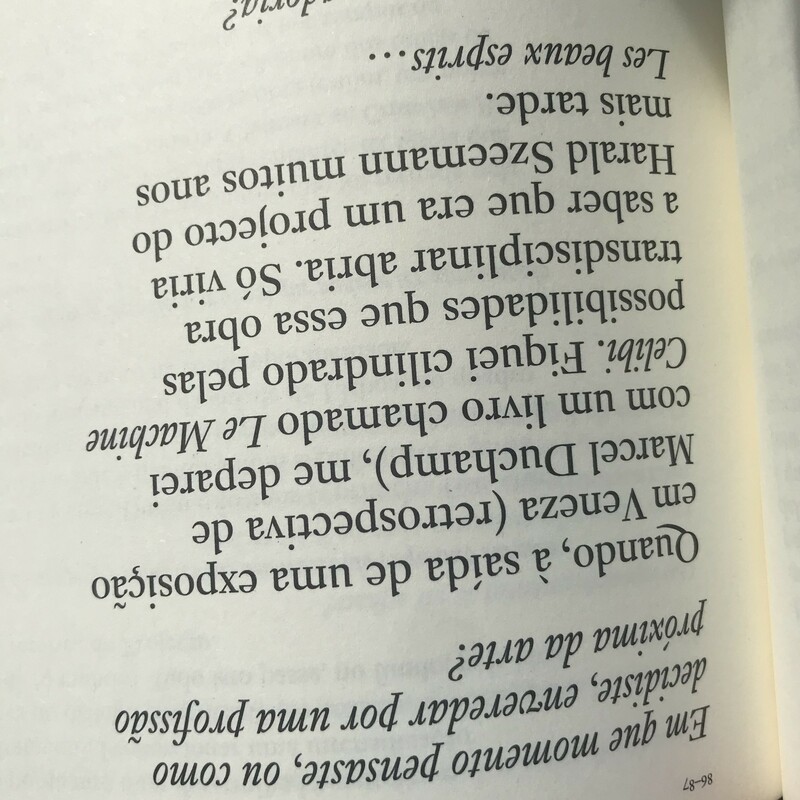 Still Alive é uma instalação bestialmente poética de Anna Galas. Integra o Festival Bella Skyway 2018. 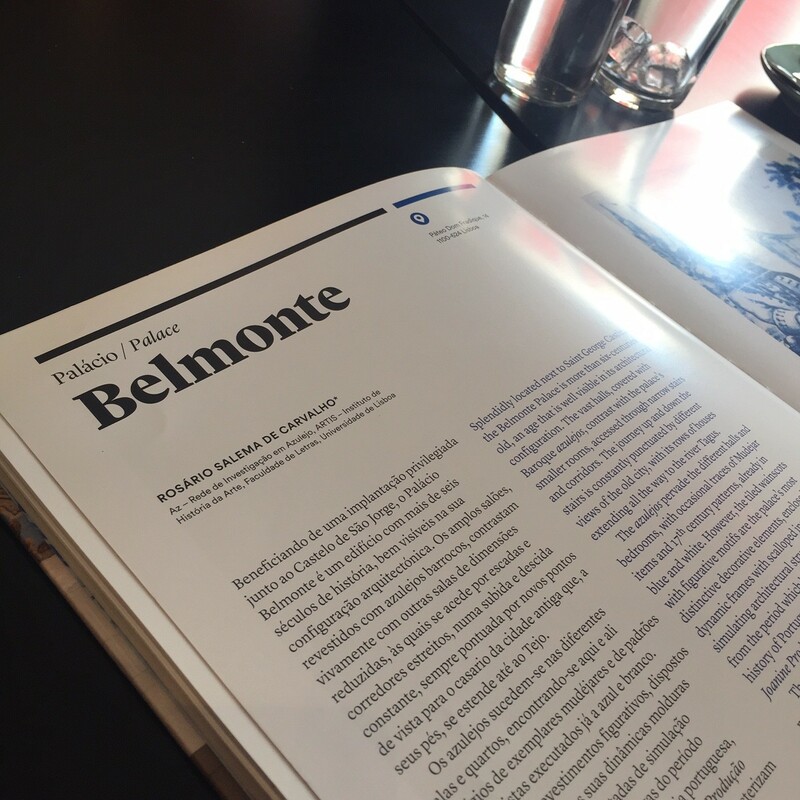 À décima edição, Bella Skyway é um evento de referência na região de Kujawsko- Pomorskie. impossivelmente fotogênica cidade de Torun recebeu durante uma década centenas de artistas e obras, entre as quais eu poderia destacar tantas. 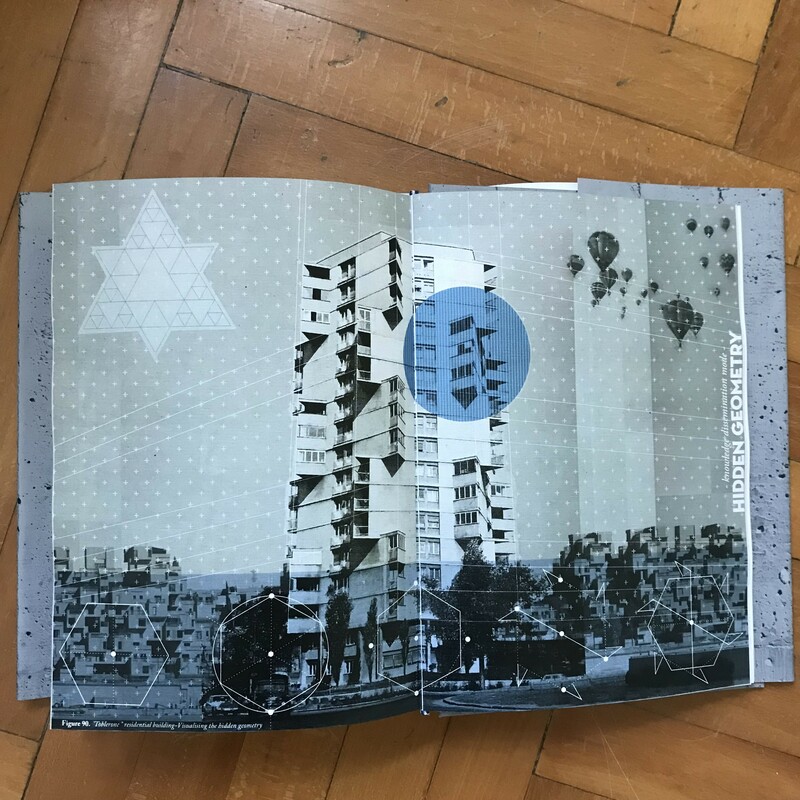 Lembro-me com especial carinho das intervenções urbanas na Ciasna por MOOV+Miguel Faro e André Banha, o Wish Comet de Jana Matejkova, a catedral de Raoul Kurvitz, os ATSARA no Hotel Bulwar, Rochus Aust na Fosa, as projecções monumentais de Nuno Maya & Carole Purnelle e dos Limelight, os ambientes coloridos dos eArchitects junto ao rio… Poderia continuar sem parar… mas recentemente, as delicadas sombras de Alessandro Lupi e Anita Ackermann. Tantas memórias! Este ano, ao visitar o festival que tenho o orgulho de ter criado em 2009, há um par de peças que se destacam. O vide-mappingo à base de animação de volumes por Anna Pytlak e Łukasz Kosela (com a participação da Orquestra Sinfónica de Torun), no Collegium Maximum. E claro, a esculturas de fogo dos veteranos Carabosse, finalmente em Torun! E foi bom rever rever o Marcelo! A ‘sinfonia laser’ dos AreaOdeon permanecerá como uma das grandes peças destes primeiros dez anos. Numa atmosfera onírica, a tecnologia laser ao serviço da intercepção musical colectiva em estado puro, iluminando as geometrias do espaço – o icónico edifício da Câmara Municipal – com os detalhes da arquitectura envolvente. O espírito do Skyway original passa por aqui. O vídeo em cima é da instalação deste mesmo conceito na cidade de Riga. A Comunidade da Luz nunca deixa de acreditar na magia, na maravilha e no desenvolvimento.